Mixed greens in beds in high tunnel. Key resources: High Tunnels Manual by Ted Blomgren and Tracy Frisch. See especially case studies of Star Light Gardens and Slack Hollow Farm. For more details on seeding dates, plant species (greens, others), and techniques, see the Winter Harvest Handbook by Eliot Coleman. Snow: For overwintering cold hardy greens, your structure must withstand snow load. For late- and early-season greens production (not dead of winter), other structures like caterpillar tunnels and low tunnels can suffice, but these do not hold much snow load. Venting: Gable vents are important for venting during warm spells in the winter, (in addition to roll-up sides used during warmer weather). It’s important to get rid of warm humid air to decrease disease problems, and to vent adequately in spring (March) to avoid overheating. Size: A higher, taller structure holds heat collected during the day from solar gain better than a shorter, narrower one.A structure covered with two layers of poly (inflated) will be 40% warmer than a structure covered by a single layer, but will lose 10% of light transmission. Soil Prep: Soil is often prepared for seeding by rototilling, but any method that leaves a fine seed bed for small seeded plants is fine. Test soil to determine pH and nutrient needs. Timing: Growth rate slows in the winter months because of cold and lack of light (cloudy, short days). Between the end of December and the beginning of February (when day lengths drop below 10 hours/day), there is little or no growth. Winter production of greens relies on “banking” greens that grow in late fall for later winter harvest.Cold-hardy greens can be sown from early September through the first week of October for harvests in November and December.Spinach sown in late September or very early October can be harvested in the end of December, the end of February, and the beginning of April. Seeding methods: Greens are usually direct-seeded. For thick blocks of baby greens, a “pinpoint” seeder is often used (see Johnny’s Selected Seeds – 6-row seeder). For distinct rows, Earthway or Planet Junior seeders are options, as is the pinpoint seeder with some hoppers left empty. Seed spinach at 12 to 16 seeds/foot within row, 4 inches between rows. (Earthway seeders do not work well for spinach.) Pack the plants into that space! 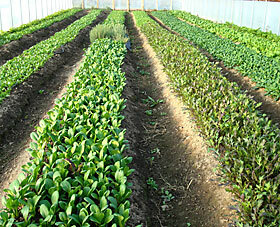 Asian Greens’ such as mizuna, tatsoi, pac-choy. You can search for varieties and read descriptions and reviews at the Cornell Vegetable Varieties for Gardeners website. It’s best to start by planting varieties in different blocks rather than mixed together, since growth rates and times of maturity are different. The mix can be created at the washing station. For details on seeding dates, plant species (greens, others), hardiness and techniques, see the Winter Harvest Handbook by Eliot Coleman and Extending the Harvest Season with Fall Production. Tat soi and some other Asian greens. Irrigation: Overhead, sparingly in winter since water seeps in from sides and plants aren’t transpiring much. It may not be necessary to water in the winter at all. Internal covers: Medium-weight row cover supported on hoops gives 5-10 F warmth, more on colder nights. Multiple layers can be used to try to keep greens from freezing. (They can’t be harvested while frozen.) But those covers must be removed during the day for light transmission. Harvesting: Use a sharp knife. Some people prefer a short knife while others like a longer one. Johnny’s Selected Seeds has a greens harvester that works on thick stands of baby greens, though hand harvesting is most common..You can only harvest plants when they are thawed. So after cold nights this, may mean waiting until mid-morning. There will be some cold cloudy days when the crops don’t thaw out completely, which will delay harvest unless you use supplemental heat. Yields: You can expect to harvest approximately a quarter pound per square foot of hardy salad mix, and a half pound per square foot of spinach over three harvests from December to April. Weeds — particularly winter annual weeds — can be a problem. With the very close plant spacings commonly used, weeding can be difficult. It’s better to prevent weeds by never allowing them to go to seed. This can be done with a combination of cover crops and hand weeding. Chickweed is a problematic winter weed because as a winter annual it is adapted to thrive in the same conditions as your cold-hardy greens. At least it’s edible. A stale seedbed two weeks before crop seeding helps to reduce chickweed. Aphids can pose a threat to winter greens production. Aphid Management in Winter Tunnel Greens. Downy mildew can limit the production of spinach in the winter. Some newer varieties are advertised to have resistance to many races of DM. If your variety has resistance to races 1-3 but the infectious race in your tunnel is #8, your spinach will look as bad as one without any resistance. Meadow voles eat their own weight in vegetation every day, love the protected environment of the hoophouse, and can wreak havoc on a winter greens crop. Traps help diminish their numbers.